It looks lovely. I feel it could be a bit better quality. I have a feeling it may not last. Bring rich color into your bedroom with the 3-piece duvet cover set. Made of combed cotton with a 400 thread count, this set is available in a variety of vibrant colors to match any style or taste. 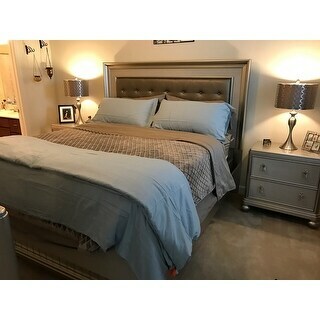 I wanted a nice quality ice blue duvet cover to go with my new Chadsworth down comforter I bought on Overstock. And this duvet cover turned out to be exactly what I wanted and pictured in my mind. The down comforter is oversized and this duvet cover fits perfectly. The button closures along one side of the cover are nice, it's easy to get the comforter into the duvet cover (and both are king-size), and the buttons don't come undone either. I washed the cover and dried it, and it wasn't wrinkly when I took it out of the dryer. I put my new comforter in my new duvet cover and it looks great. The cover does not have ties in the corners but the comforter does not shift inside the duvet cover at all. After being on the bed it hasn't wrinkled a lot either. Even better, after a few days the duvet cover starts to "fit" the baffles on the comforter so it looks sort of like a puffy comforter with 10-12 inch baffles. I know Internet buying can be risky, but this is my third purchase on Overstock and everything has been great. Better than what I can find in stores and better price for the higher quality too. Received these the other day in hunter green and love them. They washed well, and are not a lint or cat hair magnet. The cotton is soft and the dark green is a warm, dark, natural plant color that seems to match any sheet set. They're thick enough and the comforter has ventilation. I'm very happy with this duvet set and I recommend them. I like this duvet set. I also have the matching sheet set. It's soft and the price isn't bad. My only complaint is that there are no ties inside the duvet cover to hold a duvet insert in place. I laundered the duvet before using. It came out fairly wrinkled but after on bed for awhile looked better. I just did a second laundering because of little dirty paw prints. This time there were very few wrinkles. Takes a little time to put a king size on by yourself but fairly easy. Also adds xtra warmth to the down blanket we use. I'm very pleased with this duvet. If you are looking for a fancy look this is not for you. It's a great country look. I bought the ecru but don't remember if that's what the color is called. Very pleased. I loved the quality of this duvet and shams. The color was true and the thread count superb. LOVE my new Duvet set! Color is a really rich plum, fits my Cal-King comforter perfectly, with no bunching up at the corners. The pillow covers have a nice side type opening, so that they look good even if they get put on the bed with the "back" side showing. The fabric is soft, not "scratchy". Great product! plum is really nice, eggplant color. 400 thread count, I was worried about, but it is not thin or not worst then my 650 thread count duvet set . I washed it cold setting and dryer moderate heat and looks great. It doesn't have much wrinkles, color stayed the same. This cotton has a silky feel to it. Have I never owned 400+ thread count before? Perhaps... this duvet cover is heavenly! I got it in white, which is a perfect match to my white sheets. True white. An ivory throw I have on the bed is much darker. It’s really hard to find an all cotton duvet cover for a lower price. This one is not fancy but perfectly good quality. The sage color is nice and matches well with other sage colored linens. Very comfortable duvet set. Wash and ready to use. Love the pillow shams that open on the end, not the middle. Too thin they are see through! The material is way too thin almost see through with is not a good look for a duvet cover. I chose white maybe that makes the case worse. Wouldn't buy again!! The color is perfect and the fabric is snuggly soft. However, every speck of lint, etc. seems to be attracted to this duvet. We were looking for a very soft, fairly thin/light duvet for our down comforter and this one is perfect! This duvet cover (I got King size in White) is ok. The fabric is soft, but it also attracts EVERYTHING: any dust and pet hair will end up on it. The fabric is sateen weave. King size is a bit big on my king comforter. The duvet is a beautiful color, soft, everything as advertised. I received it quickly. Great price and soft too! This duvet is super nice. I purchased it in light blue and it looks great! Beautiful material. Color as pictured. Soft luxury! I bought this in several colors. Recommended! We were looking for a lighter weight comforter, as our lightweight down was still too warm. This is perfect for all seasons. Good quality as well. This color is fine in our room. This is very comfortable and easy to clean. I still use it. This is the softest comforter I have ever had. Very light for warmer nights but keeps warm all winter too. I have washed mine and it came out of the dryer as fluffy as new. I definitely recommend! Such a nice and soft duvet cover. It's held up very well to multiple washings and is easy to remove and put back on the comforter. The color is lovely as well and hasn't faded at all. The quality of this duvet is very good. The color represented online matches the product. The only con is that the duvet material tends to attract lint. Overall, it is a nice product. "Can you tell me if your hunter green is a blue based green or a yellow based green?" "will this have trouble staying on the bed and not slipping off"
"Is the Hunter Green darker than shown in the photo? I am looking for a medium-kelly green king duvet cover." Hello Lori, we try to represent the colors of our products accurately. Unfortunately, due to the difference in monitor colors we cannot guarantee that the color will match exactly what you see on your screen. The picture is also taken in bright studio lights. Thank you for shopping with us. "Do you have any additional photos? I am interested in the plum color, but i would like to see the set laid out on a bed if possible." Hello akolton, we do apologize, we are not provided with additional photos for this item. Thank you for shopping with us. green color. I hope it's good. "In which country is this duvet set made? Thanks!" Hello fireylotus, this was made in India. Thanks for shopping with us! A.S.
"I have a kings size down comforter and want a duvet for it. All the ones I like are California King size. Is this too big for my king size comforter?" This Duvet Measures: 68 inches wide x 86 inches long. You can take the measurements of your current comforter to see if it will fit. A king mattress is 76 X80. The California King would not fit. King comforter is 90 X 106 usually.